COMPLETELY RENOVATED, - This unit is the large two bedroom, two bath Condominium DIRECTLY ON THE BEACH. Master Bedroom view is looking at the gorgeous ocean. This second floor unit; Unit 213; at Sterling Sands Resort has NEW KITCHEN, BATHROOMS AND BEDROOMS. SEE BRAND NEW PHOTOS . You are steps away from the gorgeous white sand. Sterling Sands is an 8 story, 112 unit complex built in 1995 and is one of the most desired buildings in the Destin area. It is a mid-sized building with all of the amenities and is close to everything that is 'Destin'. This gorgeous Condo is decorated and equipped with everything you may need! The kitchen is fully equipped and features stainless steel appliances, granite countertops with an extra deep sink and eat-in bar. Our dining area will seat six comfortably and there is also a wet bar in the family room with an under counter wine & beverage cooler for storing those extra beverages. The beautiful furnishings are brand new as of January 2018 as are all of the bedding and window treatments with blackout lining. The den features a leather pull out Queen sofa bed along with 2 comfy chairs, all with a panoramic view of the Gulf. The family room has a 55' flat screen with surround sound that plays all your DVD's, CD's, radio and IPod/MP3's. The master bedroom has a king size sleigh bed with a new, top of the line mattress, chest, and a huge walk in closet. There is also a 50' flat screen with DVD for your enjoyment. The huge master bath has a jacuzzi tub, walk-in shower and extra dressing area just outside the bathroom. The 2nd bedroom has a queen size bed with plenty of room for a portable baby bed if needed. It also has a 42" flat screen TV. If you are looking for other things to do, Destin offers endless restaurant choices for casual and fine dining. For the shopping enthusiast, we are minutes away from Silver Sands Outlet Mall and Destin Commons which features the Bass Pro Shop. Golfers in the family are also included as there are several championship courses within a few miles, including Kelly Plantation and Indian Bayou. The Sandestin resort area, which is eight miles away, is home to the annual Boeing Open. Secured, private wi-fi comes in this condo - password provided to you upon check-in. Please check our calendar and email me today. We would love to have you stay at our 'home away from home". 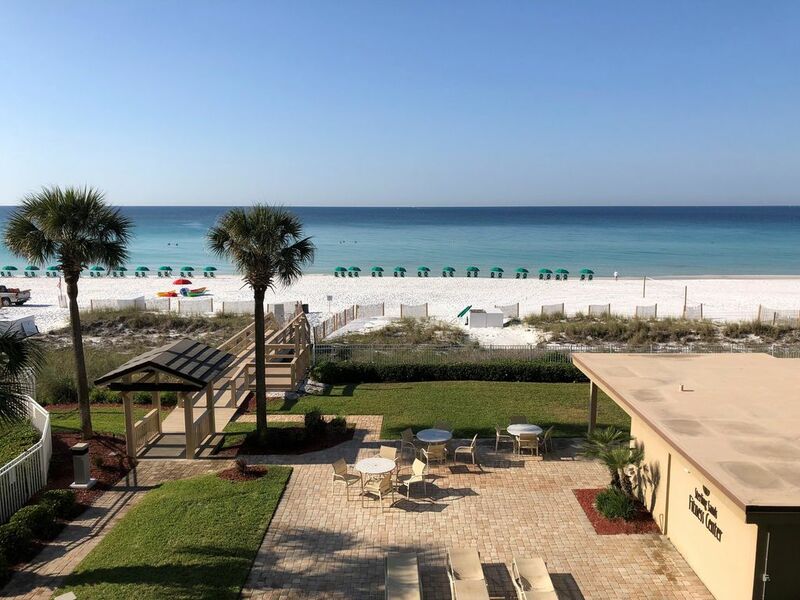 Our condo is located in the heart of Destin, and while it is directly on the beach it is also close to shopping, restaurants, family entertainment, and nightlife. We enjoy being able to walk to several very nice restaurants, and there is an amusement park right across the street and a water park 2 blocks away. Great unit, comfortable and great furnishings. Owner was responsive and very helpful with the very few things we had questions about. Would highly recommend. Bill...Thank you so much for the great review. My wife & I work hard to make sure our quest have a great time, want to come back and also recommend us to their friends. Thanks again for renting from me. Perfect location, beautiful condo, outstanding view, everything you need and more. Communication was excellent, love the digital door lock, no keys to carry. Condo looks like a designer decorated it and everything is new. Would absolutely rent this again plus you have the included beach service. Great area and perfect location. Awesome condo. Clean and very accommodating . Very nice condo, relaxing and very accommodating . Beautiful condo that has just been renovated! We just returned from staying a week in this beautiful condo. It really hits all the marks if you want location, comfort and quality! It was very clean and well stocked with all the comforts of home. High quality furnishings and tastefully decorated. The included beach service is a really nice touch and the location is close to shopping ,restaurants and all your needs. It was just as described! I would definitely recommend this rental! The owner is a delight to work with and we can’t wait to return to this beautiful condo on the beach ! Great experience here. Nice beach, beautiful water and nice accommodations. Rick responded to questions right away. Highly recommend this property. Chuck....Thanks for review...glad you had a great time.